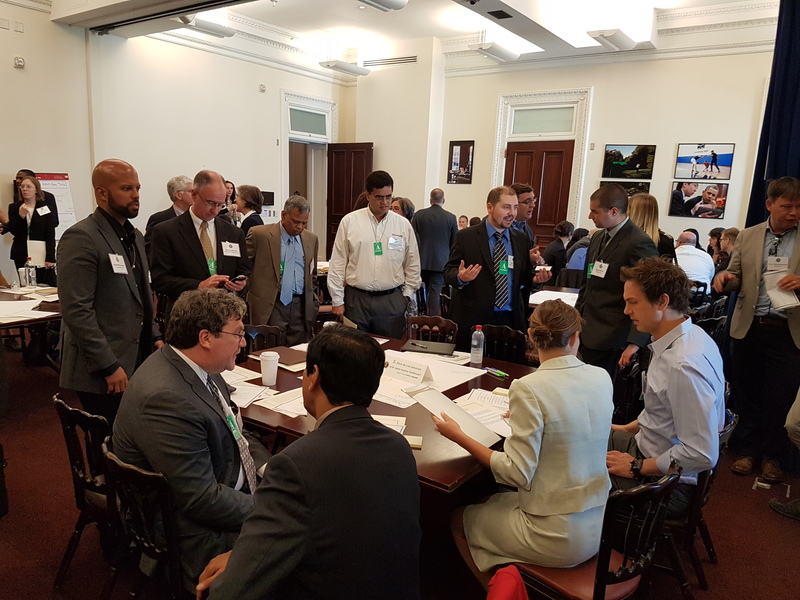 I was honored to lead a breakout session for the Maker to Manufacturer event hosted by the White House’s Office of Science and Technology. As the Executive Director of OSHWA, my break out session was on Open Source Hardware innovation. This is my take away from the individual viewpoints expressed by the group, highlighting what we can do as a community, as an industry, and from government and university perspectives. Below are the unedited notes from this breakout session. These ideas came from the collective participants in the breakout session and the views and ideas do not reflect those of the White House. Our group discussed innovation through open source hardware through cross pollination in the open hardware community, industries, granting organizations, universities, and other institutions. In this way we can change what innovation looks like. As a community, open source hardware needs to better explain the value proposition to the above listed institutions. We need to clarify the licensing around open source hardware, which OSHWA hopes to take a step toward with our certification process launching in Oct. With help, there could also be a database that grows out of the certification process with a space for contributing back and tracking changes. We need to offer educational experiences for policy makers and illustrate the social change and rapid innovation happening around open source hardware. Within the government, the open source hardware community would like to be part of any process that might create limits though broad regulation around IP and hardware. We would like to see rethinking the standards and create scalable standards and taxonomies for open source hardware. We think it’s best for conversations in this space to strategically chose particular hardware fields to introduce, educate and change with open source hardware. Tax incentives for people to share their source publicly for the good of rapid innovation, foregoing a monopoly, would be well received in the community. Finally, we need the attention of the USPTO to alter the landscape of IP and be aware of open source prior art. From a university perspective, a change must happen in the tech transfer offices for innovation to move forward at a university. Too often universities have IP constraints stemming from the Bayh-Dole Act which prohibits other inventions coming out of tax payer funded research and can even prohibit the inventor from continuing to innovate. From an industry perspective, having a standard business case, such as royalties for creating a copy or derivative, would create a mutual respect. An understanding that risk adverse IP practices such as patents has a trickle down effect on innovation. In particular, open chipsets would be more useable. Industries could benefit from an open toolbox of the first 1,000 common pieces needed for any project, or a ‘simple things’ database containing source for the building blocks would be useful. In some industries also sharing test results with the source would be helpful. At OSHWA we are reaching out to these four areas, community, government, university, and industry to assist in the changes reflected at this meeting. How do you innovate with open source hardware?  We’re primed to create value with the public- we have lots of things that we can do.  University ownership of IP is a big one. with Creative Commons- you don’t even know what that means. It’s not clear what it is. source based on OSHWA’s specific definitions. incentivizes people to contribute the modifications back to the community? Maker to manufacturer. If they were repurposed to be reusable, this would be great. software platform and make them more openly accessible. makerspaces can use, so people know what’s already out there and available. projects in a similar manner? should talk about taxonomy and how open source hardware fits. direction? We don’t even have material property databases. manufacturing, we need to rethink this. How might we screw this up? want to make it to market. have an active role in providing input and engage with regulators very early on. to embrace open source hardware. Ex. Navy can be generally hesistant and risk averse. try to create something in-house.